Sometimes, you’ll get into your car, and your steering wheel won’t budge at all. It’s a serious issue since you won’t be able to get anywhere with a steering wheel that won’t move. Rather than allow yourself to be inconvenienced by having to call for help from roadside assistance, you can usually deal with this issue yourself. There are a number of things you can try to get your steering wheel moving again. It’s generally considered best to try these methods in the following order; each step you take will eliminate a path, but at the time you try it, it’s the most likely way to fix the issue. If your steering wheel does lock up on you, here’s what you’ve got to do. It might sound basic, but the first step that you have to try is simply turning the key, and seeing if the engine responds. Even if the wheel is all locked up and stiff, the car’s ignition can be enough to loosen up the wheel and get it working again. If the car doesn’t turn on, or if it does, but the wheel still doesn’t budge, time to move on to the next step. It’s also possible that the key won’t be able to turn at all. You’re going to want to take the key out and insert it once more. Then, you’ll turn the key again, only this time, you’re going to want to turn it very slowly. If the key wouldn’t turn before, you want to put pressure on the key, trying to get it to turn slowly. Be careful, though; the mechanism might just not have any give, and if you put too much force on trying to turn the key, then you could easily snap the key off inside the ignition. That would not only make it impossible for you to fix the problem any of these easy ways, it also would make the fix at a shop much more expensive, not to mention destroying your key. Be gentle as you try to get the key to turn slowly. If turning the key slowly hasn’t worked, your next bet is to try moving both the steering wheel and the key at the same time. When the steering wheel locks like this, it’s held in place by a single pin. That means that, in one direction, the wheel won’t be able to move in the slightest. It won’t be able to turn the other way, either, but one side will have a bit of give, while the other will be completely rigid. Find the side that has a bit of give, and turn the wheel that way, while you’re putting a reasonable amount of pressure on the key in the ignition, keeping in mind not to twist too hard and damage or snap the key. It’s possible that the issue is with the key itself. If that’s the case, then there’s a temporary fix that you can try to use. Pull the key out of the ignition part of the way, and try to turn it then. Technically, the key doesn’t need to be in the whole way to get the car to turn on, and it’s possible that some issue with the key has been preventing the ignition and the steering wheel to unlock. Be careful turning it in this position; partially out, it can be even easier to snap a key by applying too much force. If this method does work, do not rely on it; it likely won’t work for long. Set up an appointment with a dealership that deals in your particular make as soon as you can, and have a new key made for your car. This can be a bit tricky, requiring a few tries to get right, so don’t give up on the first attempt. You’re going to put one hand on the steering wheel and the other on the key. Count to three, and turn both at the exact same time. It’s possible that doing so will jumpstart the process and get the car going again. You need to be sure that you’re turning the wheel in the direction that it does have some give. Also, keep in mind, just because you’re timing this down to the very instant and need to move fast, doesn’t mean you need to put tons of force into the movement. Just as before, you need to be careful about the possibility of damaging or breaking the key. It’s possible that there’s something wrong with the ignition itself, some debris stuck inside or something else interfering with the process. You can get some electrical cleaner, either at an auto parts store or a computer parts store, for pretty cheap. Spray the cleaner into the ignition, making sure to only spray a small amount, directly into the hole. Immediately after you’ve applied the cleaner, insert the key into the ignition, and turn it gently back and forth, working the cleaner into the ignition. It’s very likely that this lubricant will allow you to turn the key, and get the steering wheel working again. If the cleaner hasn’t worked, you have another option to try to clean out the ignition. You’ll need to blast out any potential debris in there with canned air. Canned air is pretty easy to acquire; any hardware store will have it for you. This, too, is pretty inexpensive, and shouldn’t set you too far back. 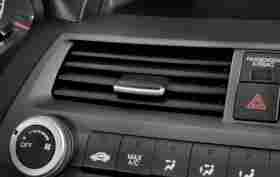 A few bursts of air directly into the ignition should be enough to clean it out. Make sure that you wear eye protection before doing this, or you could blast some of the detritus into your own eyes. The air might have knocked some of the debris loose, but isn’t quite enough to work it out of the ignition mechanism. If it’s still not turning on, you can use the key itself, inserting it and removing it in order to pull out anything that might be stuck in there. If this does work, it’s probably an issue that’s going to happen again. Once you get the car to start up again, don’t think the job’s done; get that canned air again, and blast the ignition a bit more. You want to remove every bit that’s in there, not just enough to get the car going once. If none of this has worked, then it’s very possible that the issue has nothing to do with the ignition itself, and is everything to do with a faulty key. Take the key out, and inspect it closely. You’re looking for chips, bending, any sort of damage that could interfere with the proper functioning of the key. If you identify anything wrong, you’ll definitely need to get a new key made by a dealership. On the other hand, if you don’t see any issues, it’s possible that your ignition has fundamental issues, or that the key just has something wrong that you can’t see. It might be a good idea to get a second opinion about the key, perhaps from a locksmith, before seeing the dealership. If absolutely none of the above has worked, then you’ve got an issue with the car itself. At this point, most people would consider themselves defeated, and take the car into the shop. This is a completely understandable reaction, and if you want to do so at this point, feel free to pass it into someone else’s hands. If you’re the more hands-on type, however, there is one more thing that you could try on your own. First, you need to purchase the proper assembly; any auto parts store will be able to do this, provided you give them the vehicle’s make, model, and year. Next, you will take the plastic cover off of the ignition. Usually, it will have fasteners holding it in place that you will have to remove before taking off the covering. Release the assembly inserting a 9/32” Allen wrench into the tumbler release hole, turning the ignition key backwards, and pulling out the whole assembly. It will still be connected by wires that you’ll have to disconnect, but the ignition will be free at this point. Make sure that the new ignition matches the old one, and is properly greased. caught on anything. If it does, there’s an issue with the pins inside the ignition, which means it won’t work with that key. Attach the wire to the new ignition assembly, then slide it into place. Just as you used the ignition key to take out the other one by turning it backwards, now you’ll turn the key forwards until it clicks into place. Put the covering back on. At this point, the steering wheel should definitely release. There’s literally nothing else you can do if all these techniques fail. If after all of this, you still can’t move the steering wheel, then you’ll definitely need to bring it into the shop. Most likely, however, one of the above techniques will have been enough to fix your steering wheel, and get you on the road again.